With golf, tennis & water sports, your family won’t want to leave this luxury Colorado resort. There’s plenty of reasons why families visit Colorado Springs: the Garden of the Gods, Pike’s Peak, and an array of outdoor adventures. 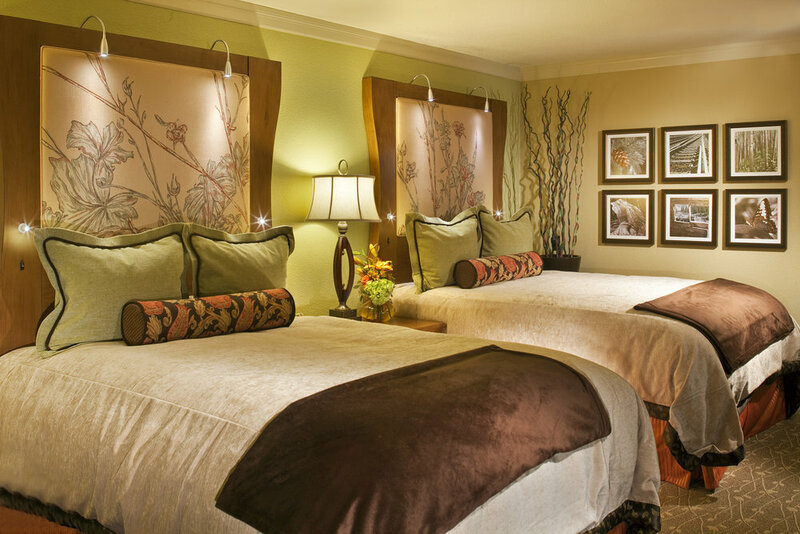 But once you’ve checked into the Cheyenne Mountain Resort, your family is likely to stay put. That’s because there are so many things to keep a family busy, there’s really no reason to travel elsewhere. From the moment that you enter the expansive lobby with its floor-to-ceiling stone fireplace and views of the Rocky Mountain’s Rampart Range, you’re surrounded by Colorado charm. On the property, you’ll find the Colorado Country Club’s 18-hole golf course, which is open to hotel guests. If tennis is your game, there are 17 indoor and outdoor courts. But it’s the pools and lake for sailing, kayaking, canoeing, and stand-up paddle boarding - all complimentary to guests - that put this resort over the top for my teenaged boys. Cheyenne Mountain Resort has 316 rooms and suites around the property in eight residential lodges. We stayed in a room with two queen-sized beds in the Cripple Creek Lodge. We had a lovely view of the golf course and driving range from our balcony. The room was nicely decorated, and the bathroom was well-appointed with a vanity area separate from the shower and tub, making it easier for families to get ready in the morning. There’s a small wet bar with a mini refrigerator and coffee maker. I actually prefer this location to the main hotel as it’s closer to the recreation. 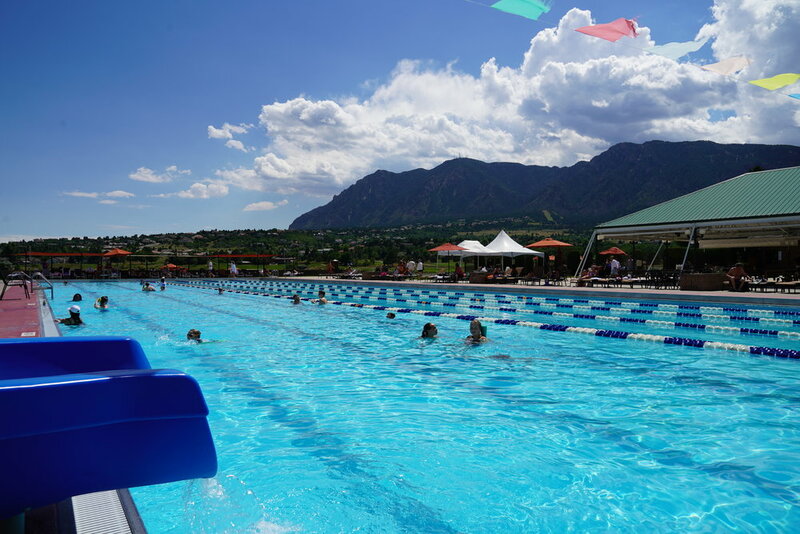 KidTripster Tip: Because the property is so spread out, it can be quite a hike from the guest rooms to the lakeside Aquatics Center, especially for families with young children. Know that you can call the front desk at any time and request shuttle service - either by golf cart or small bus. KidTripster Tip: The resort is dog-friendly, as long as your dog is under 80 pounds. Cost: $35/day. Dogs aren’t permitted in the restaurants or any of the recreation facilities. Dogs are restricted to designated walking areas. For an extra fee, you can hire a dog walker to take Fido out when you’re away from the resort. Arrangements need to be made in advance with Priority Pets. Starting at the main lodge, you’ll find the first of three pools with a hot tub and snack bar. During the evening, families gather here to watch kid-friendly movies like Pixar’s Coco play on a large screen. KidTripster Tip: Kids under 18 years old are required to have an adult present at the pool during use, which my independent teenagers found annoying. The rule seems to be enforced more in the evening than during the day. As you move away from the main hotel, you’ll come to the Colorado Country Club. Check to see which youth activities may be happening during your stay. On Saturdays, there’s instruction for pee wee players. Cost: Youth $10/hour. On Sundays, junior players can join a scramble followed by pizza. Cost: Youth $25. And on some holiday weekends, the course offers glow golf in the evening. Otherwise there’s a discount for play after 2 p.m. Cost: Youth (8 and under) Free with paying adult; Youth (9-16) $45; Adult $90; round includes a cart. Pro instruction also is available. Cost: Youth (16 and under) $55/30 minutes; Adult $65/30 minutes. 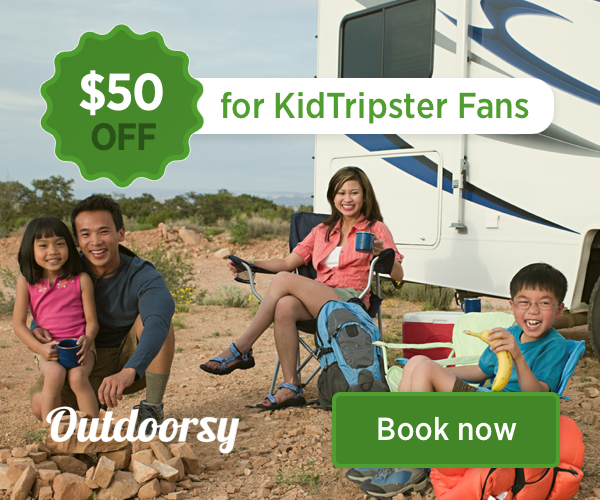 KidTripster Tip: Want an extra challenge? Ask to take out one of the new GolfBoards (think surfing + golf) instead of a cart. Riders (16 and up) must have a valid driver’s license. KidTripster Tip: Even if your kids don’t golf, head to the club house to find the resort’s game room with video and arcade games, foosball, ping pong, and billiards. My boys were happy to play here while waiting for dinner to be served at the adjacent Gates Grille. As you continue to walk away from the main lodge, you’ll come to the tennis courts - 17 in all. The outdoor courts are in excellent condition and free for guests to use; the indoor courts are an extra charge. You’ll also find a large fitness center in this area, complete with child care at the Kid’s Corner. Children (6 months to 7 years old) can be left up to four hours if parents are playing golf or 2 hours if parents are participating in some other activity. Next to the fitness area, you’ll discover the Alluvia Spa. Here I slipped away for a deep tissue massage, complete with aromatherapy. Feel free to spend time in the relaxation room or in the sauna after your treatment. KidTripster Tip: The one thing that I didn’t like about the spa was the mandatory 20% tipping policy. I would have much preferred to decide on my own tip, depending on the level of service. Finally, we come to what both my kids and I agreed is the best feature of the entire resort: the lakeside Aquatics Center. You could easily camp out here for the entire day, which is exactly what we did. The main pool with slide is enormous! Parents of little ones will appreciate the less-crowded and adjacent kiddie pool. There’s a sandy area for beach volleyball and a basketball court. At the beach, you’ll find all sorts of water toys: kayaks, canoes, and stand-up paddle boards. My 15-year-old son jumped at the chance to man a Hobie sailboat. The 35-acre lake is an ideal spot to learn. And all these activities are completely free! KidTripster Tip: The resort rents watercraft that are a cross between stand-up paddle boards and step climbers. I think that you’ll find them unnecessary with all the complimentary options. KidTripster Tip: Worried about walking back to the resort’s main lodge for lunch? No need! You’ll find grab-and-go options here, albeit at resort prices. There are also alcoholic options for the grown-ups. Speaking of grown-ups, the third pool tucked into a corner of the Aquatics Center is just for you. And coming soon, the resort will be adding an indoor pool to enjoy during those Colorado winters. Again, there’s no need to leave Cheyenne Mountain Resort when you get hungry, though you should be prepared for resort pricing at the restaurants. Let’s start with breakfast served at Mountain View Restaurant. You can order off the menu, but we found that the extensive breakfast buffet was a better option for teenagers’ appetites. Our KidTripster Teens judge any resort by the breakfast buffet, and the one here gets extra points for the made-to-order waffles and omelettes. Buffet cost: Youth $10; Adult $20. For lunch, we opted for Elevations, the sports bar located just off the lobby. The food here was really satisfying. The chicken cobb salad with lemongrass-sage champagne vinaigrette was especially tasty. For dinner, we dined at Gates Grill, located at the golf clubhouse. It has a casual menu with plenty of options that will appeal to kids. The Mountain View Restaurant is more upscale with both a nightly buffet (rotating themes like Italian or barbecue) and à la carte options. On the menu, you’ll find steaks, salmon, and locally-inspired fare like Elk Bolognese. However, if you’re dining with kids, you may want to opt for the buffet. While the food at all the resort restaurants was better than average, the service was consistently and painstakingly slow. You may need to remind your kids (and yourself) that you’re on vacation with no particular agenda. Buffet dinner cost: Youth (under 7) Free; Youth (6-12) $15; Adult $30. Individual entrées range in price from $22 to $35. KidTripster Tip: Make a reservation in advance to sit on the patio at Gates Grill. KidTripster Tip: You may want to skip dessert in favor of purchasing a s’mores kits at the sports bar. It comes with marshmallows, graham crackers, chocolate bars, and roasting sticks. It’s more than enough for two nights of roasting. You’ll find a very attractive fire pit on the deck overlooking the property. Cheyenne Mountain Resort is located in Colorado Springs. You can either fly into Colorado Springs or fly into Denver and then make the 1-hour drive south. KidTripster Tip: The resort does provide an airport shuttle from the Colorado Springs Airport. Cost: $20/person/one way; kids (12 and under) are free. You’ll likely find renting a car to be more economical. Editor Shellie Bailey-Shah has vowed to actually leave the resort the next time that she visits Colorado Springs!